It's a little tricky to make a photo of five circles look pretty, but I tried. 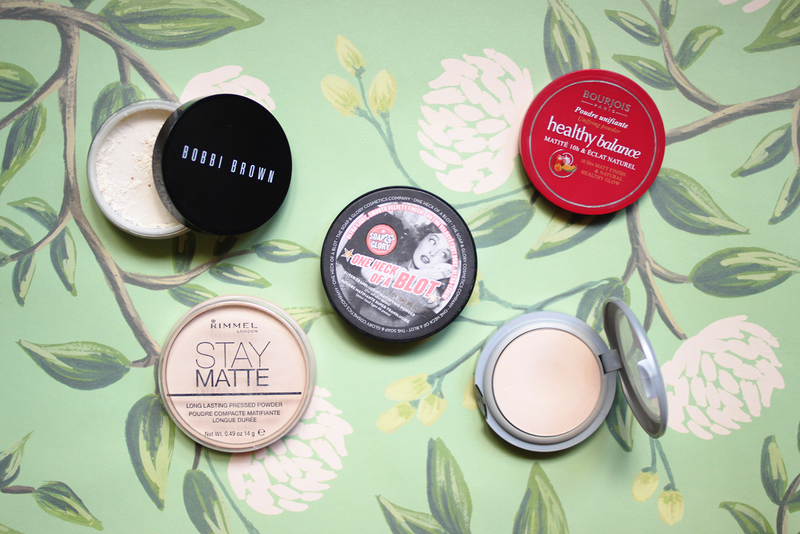 Continuing on with my Top 5 series, as you may have guessed, these are my top 5 powders. Now I expect a lot from powders, I've got oily skin and need a powder to pull its weight when it comes to oil control without making my skin look horrible and cakey. In my pre-beauty obsessed days the powder I relied on was MAC's Studio Fix which is actually a powder foundation so it has a decent amount of coverage. Good if your makeup tends to wear away throughout the day, but it doesn't really offer the natural, skin-like finish that I'm after these days. I don't mean to talk down a product that works really well for a lot of people, but a huge priority for me when it comes to makeup is to look like I'm not wearing very much of it. I know that's a bit silly to say considering I wear liquid liner and red lipstick everyday, but what I mean is that my personal preference is to look like I just have really good skin rather than looking flawless but it being obvious that I'm wearing a lot of makeup to get that look. Powder is one of the biggest offenders when it comes to makeup looking obvious because certain types will sit on top of the skin and look very heavy, and when they mix with your skin's oils over time they become really cakey and I hate the look and the feel of it on my face. It's the bane of the oily-skinned girl's life to try and get the right balance between shininess and the dreaded cake-face. But these five powders work really well for me - if I want to get through a whole day without touching up at all it's got to be the right combination of primer, foundation and powder but these are the ones I reach for most often because they offer decent oil control, are really lightweight and you can reapply them later in the day without too much product building up. I've done a bit of research on cosmetic ingredients to try to get an idea of why some help control oil and others don't. It's not easy since I'm not a cosmetic scientist, but I've found that the most common ingredients for oil control are talc and silica. A majority of powders have talc in their ingredients list (often right near the top), including all five of these, because it helps absorb oil and acts as an anti-caking agent. Silica based powders are sometimes referred to as "HD powders" because they're so fine and look like nothing on the skin. It's also pretty difficult to tell what will work just from the ingredients because you don't have any information about the quantities used other than a guess based on the order they're listed in. You can't even really always go by the claims of the product because only three of these five actually claim to help control oil and yet I find they all do a pretty good job. I think at this point my favourite powder ever is Soap & Glory's One Heck of a Blot, which contains both talc and silica. It's super lightweight, never looks cakey and really does a good job with controlling oil, and it feels really smooth and doesn't add any extra coverage as it's just a blot powder. I just need Mecca/Kit Cosmetics to start stocking S&G makeup already or else I'll have to resort to ordering it from eBay when this runs out. My next favourite would probably be the Bourjois Healthy Balance Powder (52 Vanille) which has a touch of colour to it but it's super silky and the silicones in it help to blur your pores and imperfections. This one doesn't have any silica but it contains kaolin pretty high up the inci list which is a type of clay you'll find in a lot of clarifying mud masks which also helps to absorb excess oil. Rimmel's Stay Matte (001 Transparent) is a classic - it's doesn't have as nice a texture as the others but it's also the most inexpensive of the lot and it has the cheapest packaging with no mirror. Not very handbag friendly and not particularly glamorous but it does the job the way I like it so I really can't fault it. I'm not entirely sure what's going on with the L'oreal True Match Powder (W1 Porcelain) because I bought this one in the round compact in the US but I think in Australia it's sold in square packaging? So I'm not sure if the formula is the same, but the one I have is really soft and smooth and I was surprised by how much I like it. The first two ingredients for this one are talc followed by corn starch which also helps absorb oil. The final one I've included is the Bobbi Brown Sheer Finish Loose Powder (shade 7 White) which is still a talc based formula with silica fourth on the inci list. It's super fine and completely translucent on the face and although loose powders can be a bit of a hassle sometimes I prefer them when I only want a really light dusting of powder, and I've found this is a good one for me. I also tend to prefer loose powders for setting under they eyes as they're harder to go overboard with and I find that area looks really cakey really quickly if you're using the wrong type of powder. If you have any high end or drugstore powders that you think really help absorb oil I'd love to hear what they are!